Freezing chamber temperature range: between -10 C to -30 C.
Cooling down time to -30 C: 60 min. Freeze shelf minimum temperature: -45 C.
Lowest temperature of peltier unit on freeze shelf: -55 C.
Peltier working time: 15 minutes. Maximum specimen size: 35mm x35mm. Vertical stroke: 60mm, Object feed: 20mm. 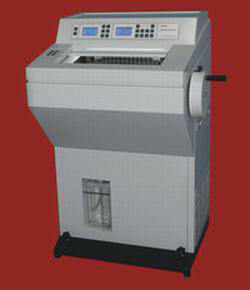 Coarse feeding speed: 0.7mm/s; 0.35mm/s. Section thickness range: 1μm-80μm adjustable. Trimming thickness range: 10μm-400μm, adjustable. Retraction range: 0-80μm adjustable; in 5μm increment. Voltage and frequency: AC220V~10% 50HZ(Standard) Special requirement (AC110V) may customize by order. It is designed under overall engineering and ergonomic concept. All the components are processed with computer numerical controlled machine. Specimen retraction function, protects specimen from blade injury. Trimming/Cutting button makes it easy to switch from trim and section mode. Equip with counter to calculate total pieces and thickness. Dual compressors, which are made in Germany, freeze the Cryostat chamber, freezing shelf, knife holder and specimen Clamp separate with pro-environment refrigerant R404. Temperature can drop to working condition in 60 minutes after switching on. Adopt to UVC sterilize for 35 minuts every time. Peltier may be on or off manually. Two defrost methods: definite time and manual. The high-precision microtome is enclosed outside the cryostat chamber to protect it from thermal expansion and contraction and keep minimum service and maintenance. Self-explanatory symbols for all functions and displays, easy to learn and operate. timed on/off and so on. Stand by mode, after initializing, the temperature in cryostat chamber can be controlled between -4 C and -9 C by computer automatically; when stop initializing, the temperature in freeze chamber will arrive to working temperature within 10 minutes. Control panel with locking function to avoid wrong operation. Wide freezing shelf may put 10 specimen cassettes. Vertical stroke: 60mm,Object feed: 20mm. Retraction range: 0～80μm adjustable; in 5μm increment. In the mandatory refrigeraton structure, one compressor, which is made in Germany, freezes the cryostat Chamber and shelf separate with pro-environment refrigerant R404.